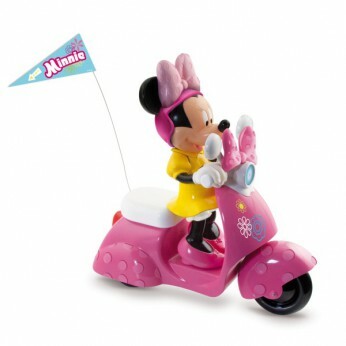 Minnie Mouse just loves to be stylish; and stylish she is on her new scooter. Coloured in Minnie’s favourite colour pink. The scooter accelerates and moves forwards, backwards, left and right. She will go where every you want her to go using the easy to use remote control. It comes complete with a fully articulated Minnie Mouse figure. Have hours of fun helping Minnie to whizz around. Includes remote control; One supplied; Size H33, W33; Batteries required: 4 x AA (not included) 1 x 9V. For ages 3 years and over; EAN: 8421134180673. WARNING(S): Not suitable for children under 3 years old. Only for domestic use. * 3974810 29.99. This toy costs approximately £29.99 (for the latest and best prices make sure you check our retailer list for the Minnie Mouse RC Scooter above). In our review of Minnie Mouse RC Scooter we classed it as being suitable for ages 3 years, 4 years, 5 years but recommend you check the manufacturer specific advice before purchasing.